Thank you for visiting my mets page. If you’re new here, a good place to start is by signing up for my weekly emails. When you hear the words you have cancer, you think you’ve heard the worst, but of course you haven’t. Hearing you are stage IV is far worse. Hearing you will be in treatment for the rest of your life is far worse. Living with uncertainty on a whole different level is far worse. Even talking about mets is hard. This doesn’t mean we shouldn’t talk about it. It’s even more important to talk about the hard stuff. 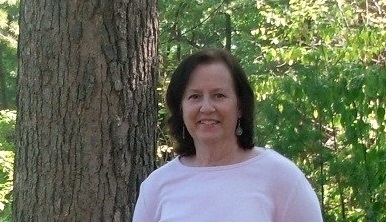 My mother died from metastatic breast cancer in 2008. My friend Rachel died from it in 2012, and recently my friend Jody Schoger died, too, from this wretched disease. Too many others have died from mbc, too many, just too many. I have friends living with mets today; friends who are living lives filled with uncertainty and treatment that will be life long. Perhaps you are living with mets. Living with mets is hard. Finding support and resources shouldn’t be. This page is part of my efforts to help raise real awareness for those interested in learning more about it. It’s a work in progress. I would love to know what you think might be helpful, especially if you are living with metastatic disease. Statistics say there are about 155,000 people living with metastatic breast cancer. Statistics also say 40,000+ people die of metastatic breast cancer each year. This number hasn’t fluctuated much of late despite the pink hoopla which seems to contradict this fact. We can’t quietly sweep these numbers away. We can’t neatly package them in pink. Facts don’t lie. 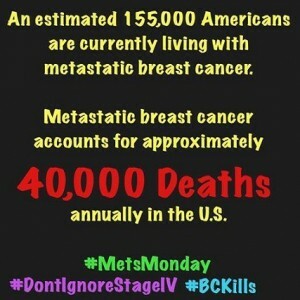 Get the facts about metastatic breast cancer at METAvivor.org or mbcn.org. What else can you and I do? Listen to the voices of those living with metastatic disease; their stories matter and need to be heard. And when metsters tell us what they need, we must listen, believe them and work with them to get what they say they need. Lip service doesn’t cut it anymore. (It never did). Read blogs written by those living with mets. I’ve included some links below. Specify that your donation dollars go to mets research. Don’t stay away from someone living with mets because you’re unsure about what to say or do. Just being there and listening will always be enough. Sign this petition. We must count all who are living with mbc. Loneliness and a sense of isolation are very real for those living with mets. No one can completely change this. However, it’s unacceptable whenever I hear someone living with mets say she/he feels as if she’s/he’s been left standing in the shadows, abandoned, not listened to, at fault for having mets, or worse, invisible – erased. This can change. This must change. Join me, along with so many others, in bringing mets awareness and the need for more mets-focused research to the forefront. Because breast cancer awareness without mets awareness isn’t awareness at all. Are you a metster and interested in being part of an exciting research initiative? Then be sure to check out The Metastatic Research Project. Let me know what you think should be added to this page or how I can make it better. If you have mets and write a blog, email me and I will add you. Follow Nancy’s Point on Twitter and like Nancy’s Point on Facebook and help me spread the word about breast cancer reality. Thank you! 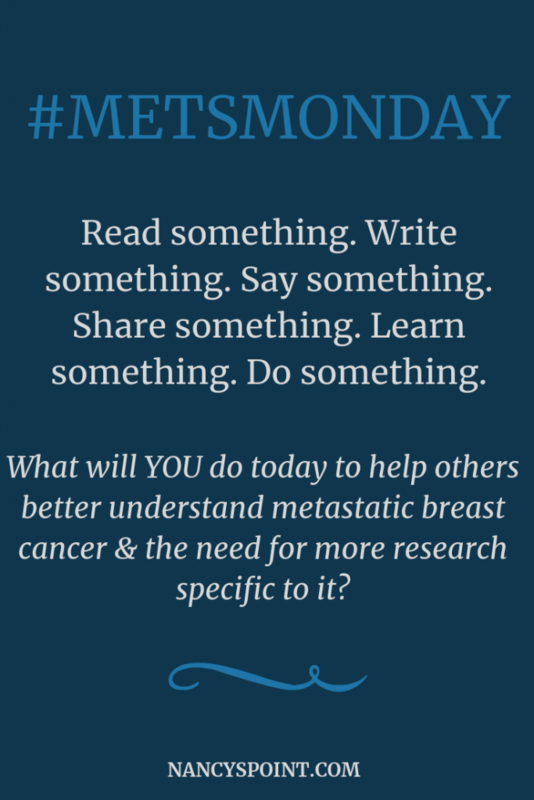 Join me every #MetsMonday (or any day) and share something you’ve read, written or would just like to say about metastatic breast cancer. Because every voice matters, including yours. Be a #fearlessfriend. Be a #fearlessadvocate. Sign up for newsletters from Nancy’s Point! 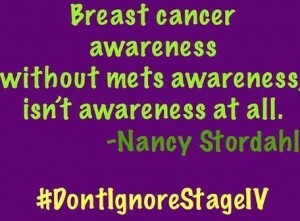 I was diagnosed in June of 2014 with Stage 4 breast cancer that has metastasized to my bones. I have been keeping a daily blog about living with mets and anything else that is on my mind for the day. Thanks for bringing this disease to the forefront. Please include my blog in your posts. Mary, I’m sorry to hear about your recent stage 4 diagnosis. I hope you’re doing alright. I am trying to do my part and yes, I will add you to my list of mets bloggers. Thank you for stopping by. I have been rediagnosed with breast cancer bone mets Dec 2014. First diagnosis stage 2 duct al in situ carcinoma 14 chemo treatments 30 radiation treatments. Estrogen based positive cancer. Taking femara and falsodex shots… have lesions to skull ribs chest neck. Meds are workin so far neck lesions shrunk.. I will beat this again.. we are strong woman!! Fight the fight! Stay positive….. mind controls the body… I was comin up on 10 years cancer free…. now I’m 10 years goin strong…. God Bless all of you!! Stay song together we must overcome this horrible battle and win!!! Suzanne, I’m sorry to hear about your re-diagnosis. I wish all the best. My 33 year old daughter was recentl diagnosed with stage IV breast cancer with bone mets. Scared to death. All of us. She could use some words of encouragement. Will you add mine, Nancy? You can use either the main site link, or the directly to the blog link. Susanne, Done. Added both links in. Thank you. I am 40 and have been living with Metastatic Breast Cancer for 5+ years. My blog is public, too. Thanks for maintaining and publicizing this list! Karen, You are added. Thank you for directing me to your blog and you’re welcome. Would you add my blog to the list? Many thanks! Susan, Done! Thanks for the nudge. Hi Nancy, Your updated mets page contains all the important elements for those looking for metastatic information. I appreciate the work you put into it. I noticed that my website has two links here. If you would like to tidy up the page, you could delete the initial name for my website, Stage IV Her 2 neu — Now What. 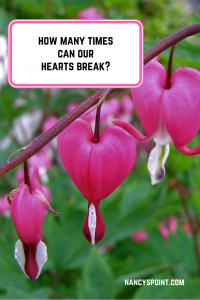 The other link is the current name of my blog, The Cancer Classroom. This page brings a lot of readers to my blog. I thank you for that. Nancy thank you for including me in your list. I just had a long conversation with a women who found me on your blog. I remember the women who talked me through my first years with mets. They have passed now but were such a blessing to me. I’m honored to be able to do the same for others. Sending love! Tammy, You are very welcome.